The US Justice Department has given its approval for business software firm Oracle to take over computer hardware software maker Sun Microsystems. The $7.4bn (£4.5bn) deal was agreed by the two in April this year, but still needs approval from the European Commission before it can be concluded. The acquisition gives Oracle control over Java, a key programming language used in its products. The takeover had been held up over questions about licensing Java. The language is used in billions of electronic devices across the world. The deal is expected to be finalised at the end of the summer. Oracle is looking to strengthen its position against rival IBM, which abandoned its own attempts to buy Sun earlier this year. 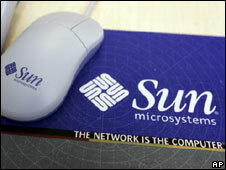 Sun employs about 33,000 people, while Oracle's workforce totals 86,000.